When you travel by bike your senses are delighted with the natural sound of trees swaying in the breeze, wonderful scents, wind in your hair and endless vistas. 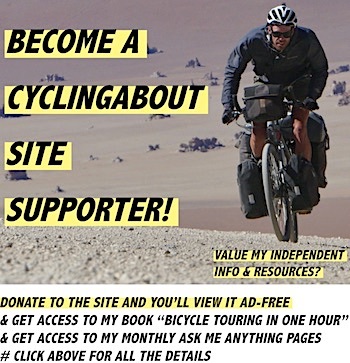 It really doesn’t matter whether you’re on a regular touring bike, a recumbent, a trike, a tandem or an e-bike – you’re in for the same amazing experience! With hundreds of millions of e-Bikes already on the road in China, e-Bike sales are now surging in Europe – especially in the countries with long cycling traditions. In some markets, electric bikes have recently been the only area of cycling growth. If you wander around the Eurobike trade show, you’ll find a phenomenal number of manufacturers looking to crack into the electric bike market. Everyone seems to be excited about the technology and potential of this bike genre. If you’re walking around not convinced by the hype, there is a full day just for testing electric bikes on the airfield. 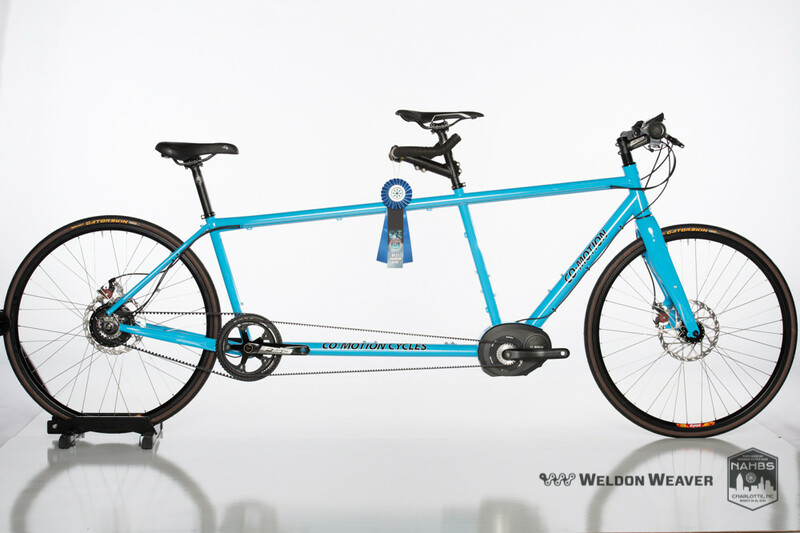 A beautiful Co-Motion Bosch electric tandem bike. In Switzerland, there are over 600 battery swap points on their major cycle routes. You can swap your battery at designated bars, restaurants, hotels and bike shops. The Swiss government sees e-bike tourism as a healthy and sustainable way to interact with their beautiful environment. E-Bikes are the real deal. Unfortunately, there seems to be a bit of a divide between those who employ electric assistance and those that pedal under their own steam. Some view it as cheating, while others view it as a great opportunity. When it comes down to it, there is no correct way to travel. You’re going to have the same travel experience with or without a motor on a bicycle. 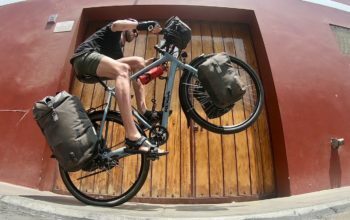 Maximilian Semsch on his 18,000km electric bike tour around Australia. – It’s better to be out and about, independent and energised than to travel without a bike at all! What Are The Disadvantages of an Electric Bike? 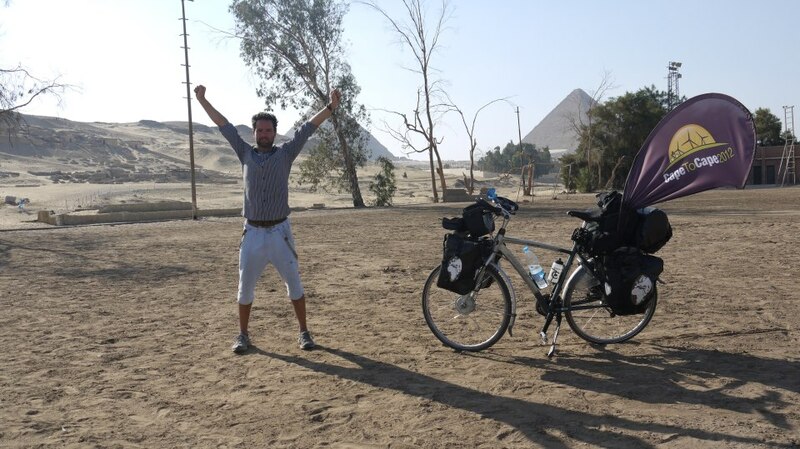 Gijs Stevers cycling on his e-bike past the pyramids. A good quality electric system will operate fine for bicycle touring. Most of them are well-sealed and designed to take shock. Quality batteries and motors will withstand a temperature range of -15 to +45 degrees celsius, as well as sandstorms, mud, snow, hail and bumpy roads. 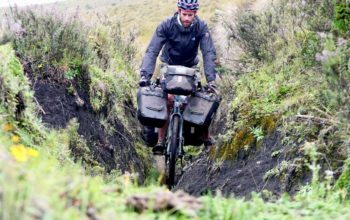 According to Gijs Stevers who cycled from Norway to South Africa with an electric bike, the only problem he ever had was after heavy rain when the computer display fogged up. Battery range depends on a number of factors: the size of the battery, how hard you’re pedalling, the assistance level you choose, how hilly your route is, how windy it is, your weight, bikes weight, tyre inflation, road surface etc. Basically, range can be anything from 10km to 300km. Gijs mentions that if you can cycle at 18km/h on the flat in non-windy conditions, a 250w electric engine can bring you up to 25km/h. A 400Wh battery will assist at this level for up to 100km. If you choose to have less assistance you will achieve an even longer range. Many people who tour with e-Bikes are selective with their electricity usage – saving the power only for the hilly and windy bits. E-bike riders learn to preserve battery by coasting downhill and working the gears as often as possible to make sure they’re always in the optimal gear. Ondra and Susi’s electric bikes for a trip through Mongolia. It is surprisingly easy to find powerpoints on a bike tour. Most people recharge their batteries at hotels and guesthouses that they stay in along the way, but you can recharge in cafes, petrol stations, churches, offices and supermarkets if you’re polite enough. If you cycle more than 100km per day you may want to consider doing a bit of charging over lunch. A half-charge over a restaurant lunch should get you another 50km down the road. The full charge time for electric bikes is often 3-4 hours, depending on battery size. Are They Really Worth The Trouble On A Bicycle Tour? 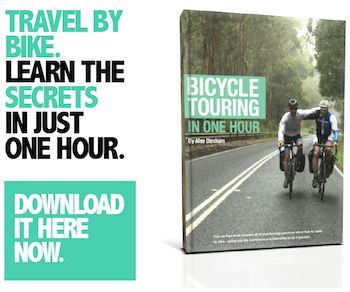 They can be – it really depends on what you’re looking to achieve on your bike trip. The bike itself won’t be a limitation as the motors are reliable and quick to charge. Power points really aren’t that hard to find in populated parts of the world either. Gijs suggests that the extra weight incurred on an electric bike is nullified when the motor helps you out in the hills. 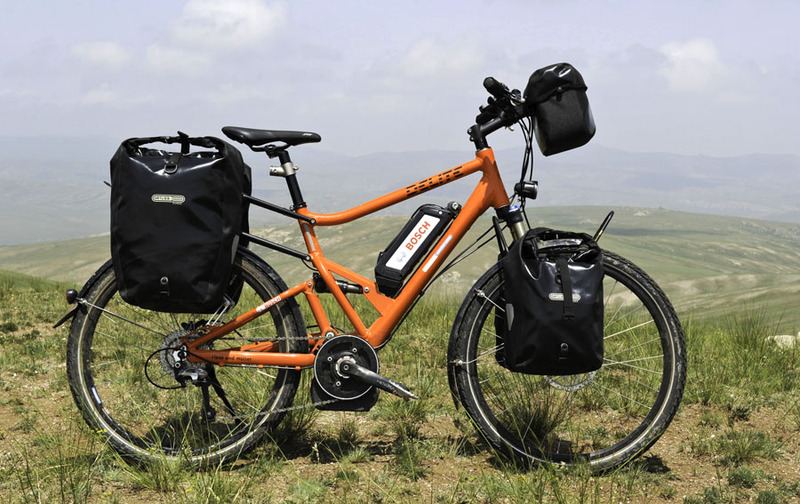 To combat range, e-bike tourers often carry two batteries. That way if they need to use the highest pedal-assist setting they will still get 100km of range out of their 800Wh worth of batteries. 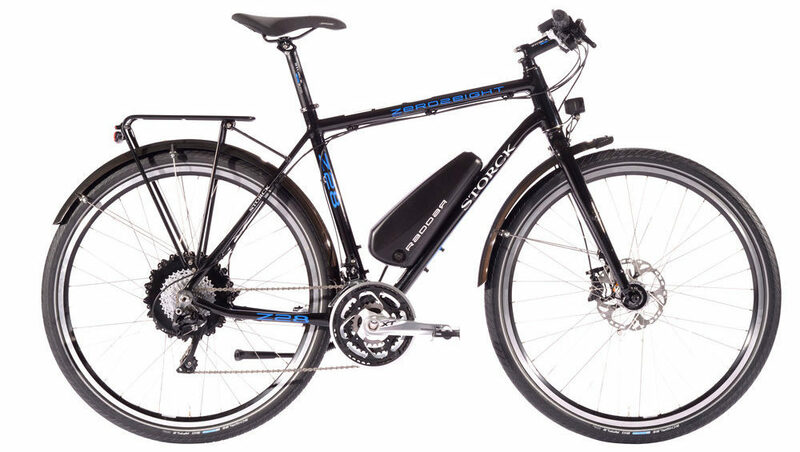 Pedal Assist (also known as Pedelec): This style of e-Bike will assist you only when you’re pedalling. A torque sensor in the motor determines when it should be operating, and this is sometimes combined with a cadence sensor for accuracy. 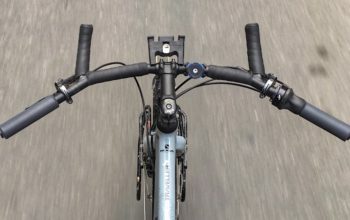 Better quality pedelecs have almost no delay between when you start pedalling and when the motor assists, making the power delivery seamless. Some pedelecs even have the ability to deliver more power when you’re pushing hard, and less when you’re pedalling light. 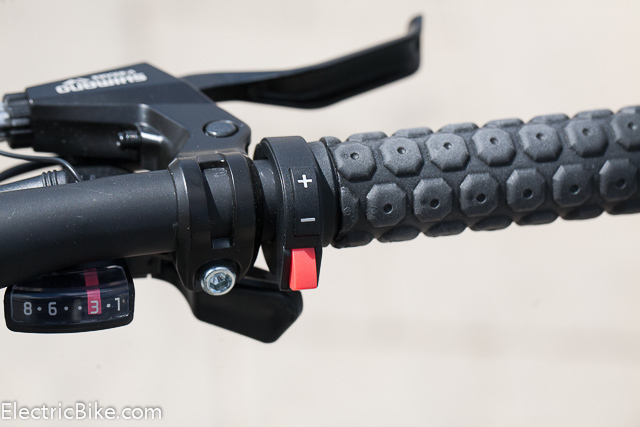 Throttle: These bikes have a grip-twist or button on the handlebar so that you can choose when and how much power you’d like to use – they operate like a throttle on a motorbike. Throttle systems can be incorporated into pedelec bikes too. Mid-drive (centre-drive, crank-based or central) motors are located at the bikes crankset. One of the biggest advantages of mid-drive is that it employs the bikes gears which results in optimal torque in a variety of situations (eg. climbing or on the flat). This makes the motor both efficient (better range) and effective (especially on hills). You can use standard wheels on mid-drive bikes, giving you options for internally-geared and dynamo hubs. Standard wheels also make it quicker and easier to take wheels out to change things like punctures. The mid-drive system is lighter in weight than hub motors. The weight is also located low and central on the bike frame, affecting the bikes’ handling only minimally. There is no need for torque arms or strengthened dropouts on these e-Bikes, but you will often require a bike frame designed specifically around these motors. 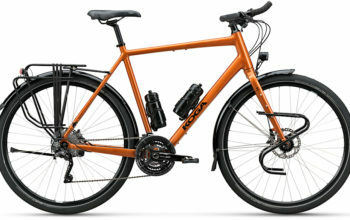 Most e-Bike manufacturers are currently moving towards mid-drive bikes. Example mid-drive manufacturers include: Bosch, Yamaha, Panasonic, Bafang, Continental, AEG, Impulse, EcoSpeed, MAC, Shimano STEPS. 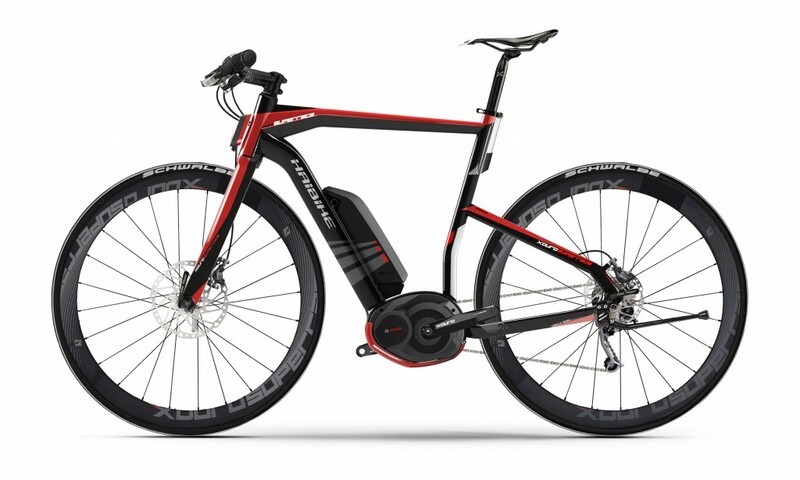 The Haibike Superrace is one of the more striking e-Bikes using a mid-drive motor. 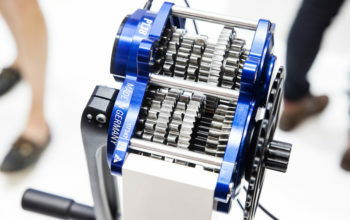 Hub-drive are the most common type of motors on electric bikes. Hub motors can be exceptionally powerful and efficient and are easily fitted to almost any standard bike. 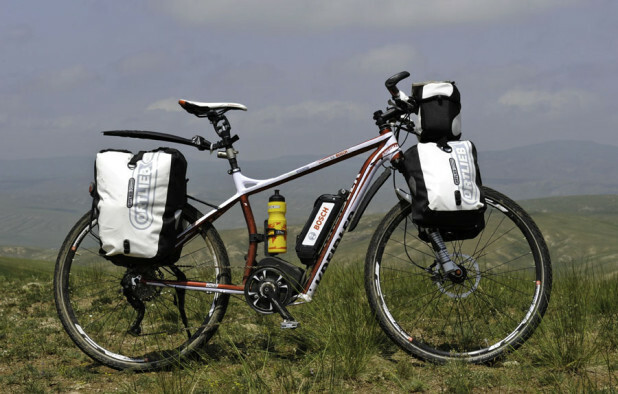 Geared motors (such as the BMC V4) are more efficient in the hills, are smaller/lighter and have no wheel resistance. The trade-off is more motor noise and reduced reliability due to the 10+ moving parts. Direct-drive motors are more common as they are the quietest motors available. They’re also super reliable because there are no moving parts. The downsides include increased hub weight, and less torque available for climbing hills. It’s worth noting that with some direct-drive motors you can also harness power through regenerative (regen) braking or on descents. Front wheel motors are simple and elegant and are great for retrofits to regular touring bikes. Front hubs are often preferred in the case where someone wants to use an internally geared hub such as a Rohloff 14s, Shimano Alfine or Nuvinci. The main downside to front motors is that the weight up front affects the handling of the bike. Rear hub motors are a popular choice on modern e-Bikes as additional rear wheel weight has less of an effect on bike handling. This means that you can fit really heavy and powerful motors (up to 1500w) to an eBike to boost the performance. In order to use a rear hub motor, derailleur gearing (or a Pinion gearbox) must be employed. Be aware that strong rear frame dropouts are required for more powerful motors. This Cube uses a GoSwissDrive rear hub motor. A motor connected to your bike isn’t the only way to power yourself along. Electric trailers can also push you along! You can get yourself a Ridekick trailer, or you can even build your own trailer with an incorporated electric front hub. The key advantage of an electric trailer is that if you don’t want to lug around the heavy motor and battery, you can unhitch it in seconds. In many parts of the world, electric motors are legally restricted. 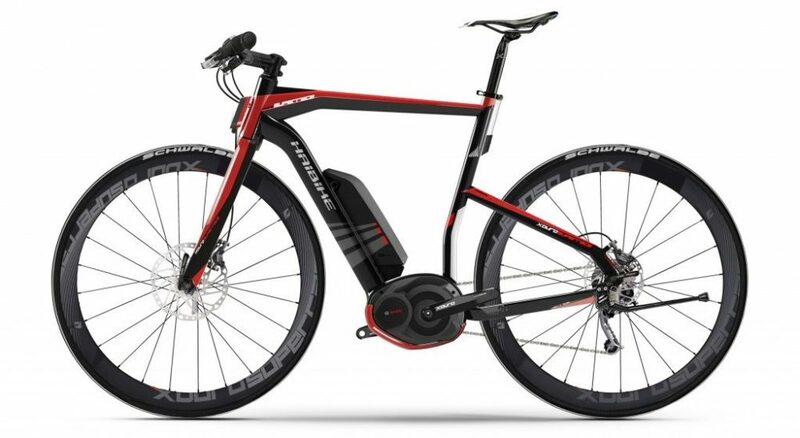 In Europe and Australia, eBikes are limited to 250w, while Canada allows 500w and the USA 750w motors. Electric bikes are also speed limited to somewhere between 25-32km/h (15-20mp/h), depending on country. Are electric motors more powerful than 250w necessary? To put it simply, a 500w motor can provide twice the assistance, but the batteries will last half as long. 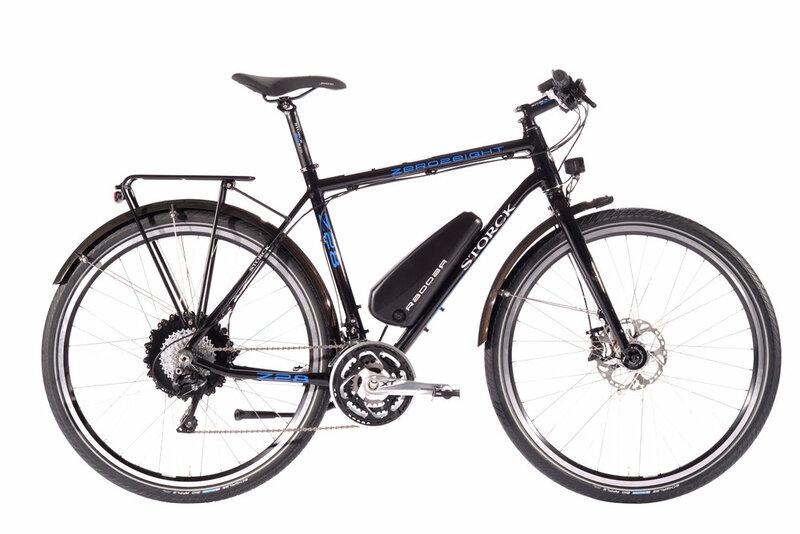 Given that range will be important to most bike travellers, a 250w bike with big batteries is quite adequate. Batteries are typically found in 24, 36 and 48v configuration and the amp hours are generally between 6-17Ah. This results in batteries in the 200-700Wh range. In essence, the bigger the battery, the more distance you can cover between charges. Keep in mind that bigger batteries with more range are both heavier and more expensive than smaller ones. At the minimum, I’d suggest using one or two 400Wh+ batteries for bicycle touring. Batteries are mounted under the rear rack, along the seat tube or on the down tube. The best location for a heavy battery is the lowest and most centralised, often along the seat tube – this reduces the affect of the batteries weight on the bike handling. Specialized have one of the neatest battery setups available. Like most things, it is worth investing into the mid-range price point to get a product that is both refined and reliable. Most sources suggest US $1500 at a minimum, but you may need to spend US $4000 to get the product you like. A retrofit electric kit won’t look as pretty, but it will undoubtedly work out cheaper at sub-$1000 for a midrange battery/motor. You’ll also be able to fit it to a touring-specific bike which you may already have. More on retrofit kits below. Although none of these bikes are specifically designed for bicycle touring, they’re all of a high quality with decent components. To do a long tour with a heavy load, you may need to swap out the spokes and rims for something more heavy duty on any of these off-the-shelf bikes. Don’t forget to test ride as many bikes as you can because there are many different styles of e-Bike. Make sure to take note of your position on the bike, whether the bike can carry water and whether there is space for racks and mudguards. If you want to get right into the nitty-gritty learn about frame geometry and see how well suited the bikes are for touring. Storck build a neat touring e-Bike. There are lots of different kits that you can buy to turn your regular touring bike into an electric bike. Conversion kits are often cheaper than similarly performing e-Bikes. Prices start from a few hundred dollars right up to about US$2000 for some of the more powerful kits. The recommended minimum spend is in the middle price bracket where you can get good value, decent batteries/components and a long wear life. Canadian brand Bionx is the highest regarded for their refined products, although their prices do reflect that. 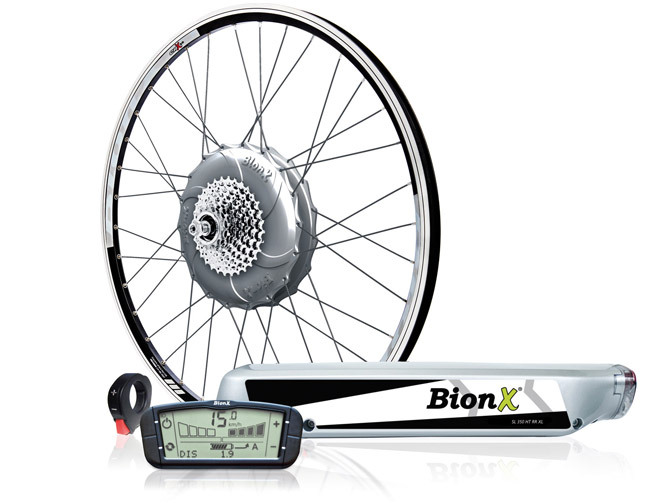 The Bionx is one of the most popular retrofit kits available. 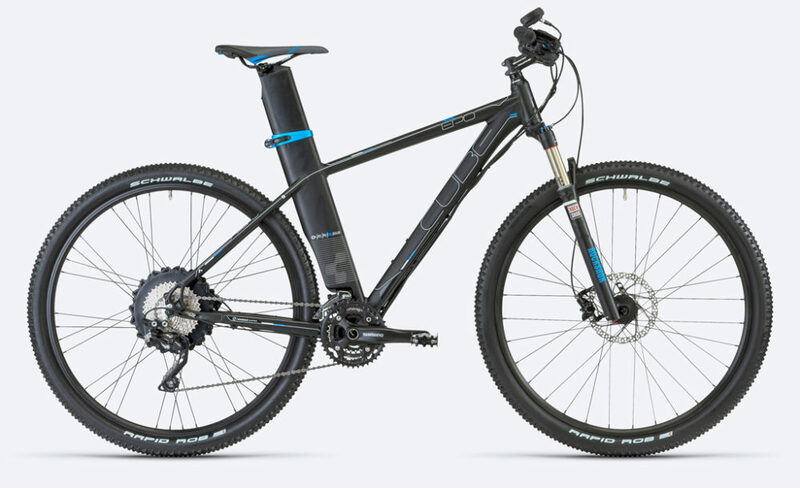 What Are Your Thoughts On E-Bikes? Has This Resource Changed Your Mind On Them?